The Youth Summer Program at Esh Circus Arts offer kids and teens ages 5 to 16 an opportunity to explore many aspects of the circus arts, including ground acrobatics, aerial acrobatics, tumbling, juggling, wire-walking, clowning, hula hooping and much, much more! The program is open to kids and teens of all experience levels, from circus newbies to budding Big Top pros. Each week of the program concludes with a circus show so that participants can show off their new circus skills to family and friends. The program runs from 9am to 3:30pm Monday-Friday. Early drop-off and late pick-up options are available. On Fridays, family and friends are invited to the end-of-week show from 4-5pm. Esh is committed to providing the safest and best circus experience that Boston can offer: we maintain a 5-to-1 student-teacher ratio in the Youth Summer Program. Our youth program instructors are all highly-trained, professional circus performers and coaches, and many of our youth coaches have additional professional experience in fields such as secondary education, pediatric occupational therapy, psychology, and child development. 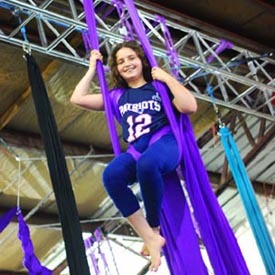 The circus studio at Esh Circus Arts is a large 4000 square foot space in the heart of Somerville, fully equipped for circus fun. The studio features multiple aerial points with static and single point trapeze, aerial silks, aerial hoop, and more; tight wire and walking pipes; fully matted floors; juggling props; and loads of safety mats! Our facilities and equipment are inspected and maintained regularly. Explore our website - www.EshCircusArts.com - for more information, or contact us at info@eshcircusarts.com to register your child for the Youth Summer Program! Directions available on our website.